In the face of a changing culture, families must be valued again as an institution and mustn’t lose courage. In this interview, he also discusses how families facing persecution have been considered, how the meeting in Philadelphia, Sept 2015, has impacted the upcoming one’s planning, and what he hopes it brings to his nation’s families. Moreover, the Irish prelate discusses why Pope Francis has ‘revolutionized’ the concept of the synod, and how its fruits require the Church’s continued cooperation. ZENIT: Archbishop Martin, how has Pope Francis supported the family and why is this World Meeting of Families so important? Archbishop Diarmuid Martin: The day belongs within a process which has been initiated by Pope Francis, almost since the beginning of his pontificate, its first days. He chose the theme of the family for the synod. He revolutionized the concept of the synod, including also, consultation of families and this process has to go on. It’s a process of accompanying families, in their challenges and difficulties, including in the economic and cultural difficulties in which they live. And it’s a process of encouraging families. Families–or at least the vast majority of families–do their very best in a cultural or economic climate which is not always very positive. We need to support them, give them encouragement, and also work toward the legislation and economic policy which enables them to carry on the things they want to do. Most families are very pleased when their child does better than they did and they take great pride in their child doing well. When we talk about the families in the Church, it isn’t just that families should be involved in structures, but that they witness to the love of Jesus Christ, the tender love of God, especially through their own love of their spouses or their children. Maybe in the Church, we have not underlined this as much as we could have. ZENIT: The families experiencing persecution at this time, how are they being considered? 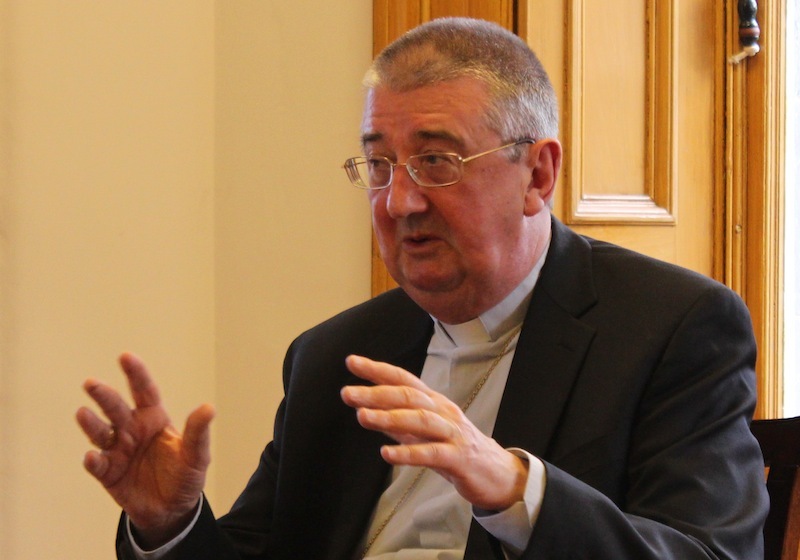 Archbishop Diarmuid Martin: One needs to, in an international context, raise this question. Very often these families give extraordinary witness in just simply being Christians, in an area where they’ve become second class citizens. ZENIT: Has the World Meeting of Families in Philadelphia this past September played a role in the planning? Archbishop Diarmuid Martin: Well, I was there. I watched. I think that one of the problems that occurred in Philadelphia was that the level of security was extraordinarily high, and we hope, that in Ireland, we won’t have the threats which raised the level of security … A lot of people just want to see the Pope and many couldn’t due to the incredibly heightened security. But otherwise, it was an extremely well-organized event and we will learn from the experience. ZENIT: What do you hope Irish families take away from this meeting? What do they need? Archbishop Diarmuid Martin: I hope that they begin to value the family as an institution again and not to lose courage in the face of a changing culture. I hope that they are able to explain to their children what the fundamental values of family are about: Why should people be faithful? What are the benefits that come from this? And families do experience this. I gave an example when I spoke at the synod of when I worked in an institute in central London for ex-prisoners. And we had in front of one of the largest prisons in London, a small shop which was to be knocked down, demolished. And I remember we used it to offer the wives of prisoners to come prepare themselves, prepare their babies, leave them there, as they couldn’t bring them into the prison. But these women never missed a week, even if it were to visit someone who probably had been very unfaithful to them. And I said they probably wouldn’t have been able to pronounce the word ‘indissolubility,’ but they knew what faithfulness meant. That was the extraordinary thing. And that visit meant so much to the person who was in prison. ZENIT: Archbishop, do you read ZENIT? Archbishop Diarmuid Martin: Yes, because I am curious about what’s going on in the Church.